D6 Addiction: Is it time to take the nerf bat to Biel Tan? Strategies, Battle Reports and general thoughts for all things tabletop gaming. Is it time to take the nerf bat to Biel Tan? So it’s a bit of a Cancon tradition, each year we see one particular army rise above the rest slaughtering all before it to take out the trophy followed almost immediately by the mob armed with torches and pitchforcks calling for it to be struck repeatedly with a nerf bat because it’s so overpowered. In 2015 it was DKOK under review because siege transports were about ½ the points they should be for balance, in 2016 Squats were considered so OP they haven’t been seen again in the competitive circuit because they are still under revision. 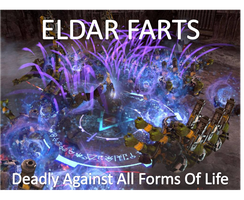 Since the day I started playing Epic I’ve been hearing the same complaints about the overpowered nature of Eldar breaking the balance of the game. I’ve been on the receiving end of it enough times to know it’s more than just a poor players having a whinge and yet in all that time I’ve seen no action, or even an intention to explore the issue properly. In fact there seems to be a consistent response of either, there is no problem, or you need to demonstrate it with data. The result of our tournament results represent solid data in this respect, in my mind especially since it was so easy to predict the winner of this year’s Cancon based purely on lists before a single dice was rolled. In fact for interest sake I wrote this article before Cancon… just added some data examples after a result that I considered as inevitable as rolling 1’s when shooting death strikes. The problem with the data driven approach is that bat reps don’t reflect the skill of the players and unless the players are deliberately attempting to break the list it’s not demonstrating the potential. My gaming group are regular tournament players and love a competitive game, so I find myself wondering if the disconnect between our group who can see the massive imbalance and other groups, including the elder AC comes from a lack of regular competitive gaming in certain groups. "kinda feel like we are trying to keep lists balanced whilst Eldar smoke us." So what I’m going to attempt below is to spell out the issues exactly as I see them. As always these are just my opinions so take them as you like but in my mind the overpowering advantages of Eldar are the worst thing in Epic right now. Have a read of my thoughts below and see if you agree it’s time to assemble some data to demonstrate the point. If you do then it’s simple build the most powerful Biel Tan army you can contrive and put it up against opponents running their own top builds, record the data and submit those reports on taccoms. Specifically you need to be testing the combos that I’m presenting here, it’s no point running a bunch of war walkers and then saying the army is fair and great. My suggestion is that you start with the core list I’ve presented in my article on Eldar here and then go with either a titan or some other variation but with a minimum of 13 activations in every list. As always post up your thoughts wherever you like if you agree or not discussion is great so let’s get to it. Before you drown the forums with anecdotal evidence of how you can’t win a game with elder though bear this list in mind. If you want to argue anything start by finding me a list that can match this list of inbuild advantages. Most armies are strong in one obvious area, marines have engage but weak shooting, Tau have good shooting but horrible engage, titans and Feral orks are almost the extremes of the spectrum. But who else can confidently complete in every field that matters, speed, activations, shooting and engagement. Read the list and then see what you think. Almost every force in the game that has a core/support setup (i.e. not marines/orks) has a 2-1 ratio, Eldar have a 3-1 ratio combined with one of the cheapest core options that exists. I’m sure there is some fluff argument about them having more access to elite troops etc but this is where player quality comes in. A fluffy fun player uses that 3-1 to make a thematic force, a good player abuses that 3-1 to min/max crappy guardian core choices (which actually aren’t crappy thanks to the Avatar…) with the far more effective elite choices and pad the activations with cheap scout formations making it super easy to get to 13-14 activations. For 275 points Eldar can get a void spinner which drops BP3 at 120cms with disrupt. By contrast, Imperial Guard (renowned for their shooting) can get 3 basilisks for 250. Now you could argue that with the basilisks being a bit cheaper and having longer range this is a balanced scenario. Here’s where player quality comes into the equation. A good player recognises that with 120cm 2 voidspinners can cover every centimetre of the board, more importantly with the Eldar’s strat rating of 4 and an easy ability to out deploy the guard player what actually happens every time is this – Eldar player positions his voidspinners after the guard artillery, uses the +2 strat roll to win the roll off and destroys the guard artillery before it ever fires a shot. Hell even if it did fire a shot being a DC3 war engine with RA5+ armour makes it almost invulnerable to those basilisks whilst every scrap of damage on the guard unit will cut down its shooting and break them with little effort. Shining spears are one of those units with a phenomenal combination of characteristics. They have an effective 50cm engage range and of course can jump out ad jump back so won’t be exposed to the usual risks that assault troops face. In an army with heaps of potential for activation spam and a much higher than average strat rating the options for when to engage are limitless. Combine this with skimming which is a huge advantage against most assault troops and ready access to inspiring and even double inspiring which makes them ideal for clipping engagements. With speed, hitting power, flexibility and no real risk this unit is easily better than any other engage troops I can think of. Cheap as chips, easily available thanks to the 3-1 ratio, more resilient than a sentinel what more could you ask for. I can’t imagine who ever thought this thing being free was a good idea… I’ve watched it carve a swathe through units and make decisive moves time and again. It combos so well with the triple retain it’s ridiculous. Assuming your list includes two guardians to make its deployment reliable you really can’t fail. A solid player will take advantage of its BC attack capacity where possible or just use its inspiring and resilience for a clipping engage. At 50 points it would still be a bargain. Just like the force organisation chart, nobody in the game gets a triple retain, except elder. I can’t even imagine what the justification is for something this fundamentally strong combined with their strat rating of 4 which gives them a huge advantage over so many armies. If you haven’t been on the receiving end of a turn 3 triple retain that decimated your army you just aren’t playing against good enough Eldar players. Just like with all the others I’m sure the justification is some fluffy thing about them using strike and fade tactics as if Eldar are the only force in the game that does that but a top player can use this to an amazing degree. The ability to hit and then disappear without any real repercussions is huge, every other assault comes with the inherit risk of being vulnerable afterwards… not Eldar. Of course my favourite use for this was watching an Avatar run 15cm through terrain after an engagement (where it butchered a full strength warhound btw) so that it wouldn’t be seen by the rest of the Eldar army if it died (as in no blast marker). It was a beautiful strategy but I’m struggling to comprehend that this was the intention of the creators. The irony of this is that for a lot of Eldar players there aren’t many stories of how holofields have saved your day or ruined it. Its mainly because decent players worked out a long time ago that there is no way to achieve much against them other than being stupidly lucky, so don’t bother, save your shots and maybe go for a break. We saw plenty of Warlord titans and Gargants going down at this year’s Cancon but does anyone want to guess how many Eldar titans died… People complain plenty about knights having 4+ invulnerable saves but personally I’m ok with them, after a few games I worked out that there are weaknesses to exploit and with good planning you can overcome them. After many more games against holofields I came to the conclusion there is nothing you can do which impacts them in any meaningful way so focus your energy somewhere else. I really love it when people say ‘just crossfire them’ as if reducing it to a 4+ invulnerable after managing to setup crossfire somehow it such a big difference. I also love the irony that the army most able to setup the crossfire due to their implicit speed and move/shoot rules is absolutely other elder. So overall I think the evidence is totally definitive, random anecdotal comments about this player or that player doens't balance out what you can see here but as always discussion is healthy so lets have one. I'm interested to hear how people will counter what we think is so obvious. I agree with you on several points after using Biel Tan over the last few months, although using the EpicUK army list. The Avatar should definitely cost something so that something that powerful isn't an auto-include in every Eldar army. Firestorms seem silly good too, the first few times I played them I thought they were 5+AA and didn't think they were weak. I was a bit surprised when I realised how good they are. But I feel it's mainly the points costs of units that seems overly cheap in some cases - Void Spinners, Night Spinners, Guardians, Avatar among some others. This is compounded by the 1:3 core:support ratio (which only Tau have as far as I can recall). The triple retain is something I'm unsure of. 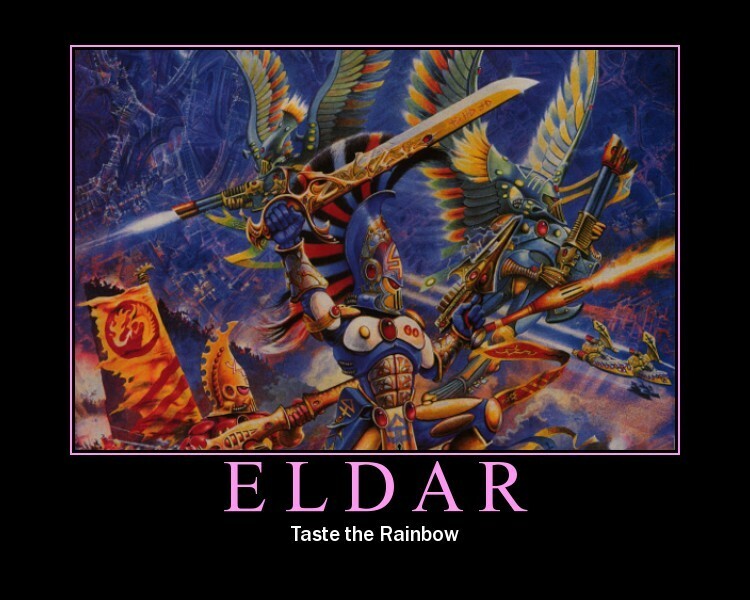 At the moment we're finding that games against Eldar can really come down to who wins Strategy. Especially when we out-activate them and move the theat in late in the turn when there's little or nothing left to react on the opposing side. Win strategy and I can break 3 units on a good day before they've done anything.